Arabic is truly a global language. It is spoken throughout the world, as the first language of over 200 million people living in northern Africa and the Middle East and as the official language of over 20 countries. Arabic plays a fundamental role in the practice of Islam as the language of the Holy Qur’an. Arabic influences are found in languages throughout the West and in many parts of Africa and Asia. 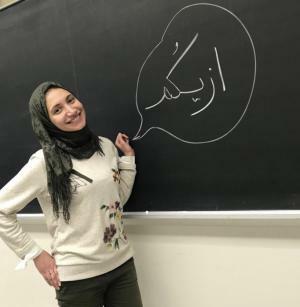 Students of Arabic have the opportunity to learn about and engage with Arab peoples directly, rather than through the stereotypes often used to characterize them. As the Arabic and Islamic worlds attract international attention, demand grows for fluent speakers of Arabic in academia, international business, journalism, government agencies, and international non-governmental organizations. Our Arabic program is an important part of interdisciplinary programs in African Studies, Middle East Studies, and Institute for Regional and International Studies (IRIS). In addition to three full years of Arabic study, we offers courses in Arabic dialects and literature courses conducted in Arabic. Our students can apply for undergraduate Foreign Language and Area Studies (FLAS) Fellowships, which cover partial tuition for one year and provide a stipend. Through the African Studies Program, our students are connected with many faculty members conducting research in and about Africa in the humanities, arts, sciences, and education. The Middle East Studies Program adds many more faculty and scholars of this region to that list. Check out Student Portfolios featuring past & current projects. Our Arabic instructors are frequently recognized for their excellence: 2016, 2017, 2018. 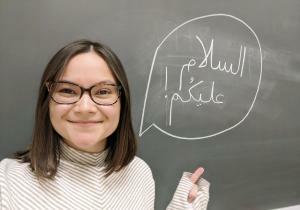 UW-Madison students of Arabic can live in Baytunaa, the Arabic language house in the International Learning Community. UW-Madison also offers intensive Arabic during the summer at the Arabic, Persian, and Turkish Language Immersion Institute (APTLII). Through International Academic Programs, UW-Madison and partner institutions offer a wide variety of study abroad opportunities throughout the Arabic-speaking world. Programs are currently available in Jordan, Morocco, Tunisia, and Israel. For more information, visit the Study Abroad website. Consult our Majors Advising Page for more information about your academic plans and study abroad.